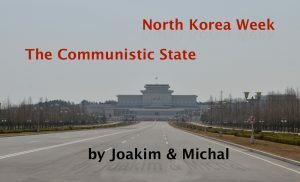 Is the regime in North Korea as secretive, or rather deceitful, as we hear in the news? One of the many reasons tourists have for going to North Korea is to actually experience this country we hear so much about, in many cases have strong opinions about but have never actually seen. I have to admit that before I went to North Korea in 2012 I assumed that it would be very different from what I was used to. These expectations did not stop me from being surprised when I found exactly what I expected. This trip was set in April 2012, just a few months after Kim Jong-il passed away. I had actually half expected that the trip would be cancelled by state-owned tourism bureau, Korea International Travel Company (KITC) for some reason connected to this, but that never happened. The 100th birthday of the founder of the country and eternal president (his actual title to this day) Kim Il-sung was set to take place during my trip to the country, so I expected to see state run celebrations galore. Indeed, I got to see military parades and fireworks, but that’s to be expected really. I thought the preparations the day before (and probably a long time before that as well) were much more interesting. I shot this short clip on the large square in front of the Grand People’s Study House the day before the celebrations were to take place. What seemed to be normal people were listening to a speaker over a PA system giving instructions about a coordinated dance routine. This has to be seen in combination with the fact that we were not allowed to talk to people in the street at all, or even really get close to them. This tells me that these people were pre-approved to be in contact with tourists, since we were indeed allowed to interact with them when they were on their resting in between the dancing. Another episode that really sticks is when we were walking (or rather guided) around a park. We met both lovely old women seemingly having a nice day, dancing and being happy. They even asked some of the tourists to dance a bit. It’s quite easy to find clips on YouTube that are years older with the exact same people dancing in the same spot. These are to be considered actors in my book, and I assume, in most people’s books. 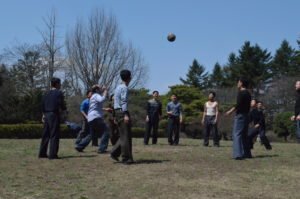 We also met a group of young men and women playing some sort of ball game in the park. We were encouraged to play with them. This was in stark contrast to other people we were strictly forbidden from talking to in the streets of Pyongyang (not that there were very many). This makes me assume they are pre-approved in some way, or were actors as well. One of the days I spend in North Korea we went to the DMZ, the boarder to South Korea. There we got some history of the war. During one of the stories the guide mentioned the recently deceased Kim Jong-il, and rather surprisingly (even though I knew this could happen in theory based on videos I had watched earlier), she actually started crying. Real tears that seemed quite sincere. This is something that will always stick with me I think, but I cannot say for sure if the emotions were real or if she had gotten the guide gig due to her impressive acting skills. There were of course a lot of episodes and impressions that might tell us something about the regime and how North Korea works every day, but I think this last example should not go unmentioned. As we all know, or can easily check, the launch was a failure. We did of course not get any real information at all, so we were in the dark. The same day, however, we went to one of Pyongyang’s few bars outside of a hotel (maybe the only one? ), a diplomat’s club. By the way, they had quite a few arcade games there! In this club we met a couple of diplomats from Pakistan (or was it India? I forget) who had just arrived. They could tell us that the launch had indeed been a failure. In itself this is not much of a story. What makes it interesting was what happened the next morning. Our dear guide proudly announced that the launch had had some problems and they had momentarily lost the satellite, but due to their scientists “working courageously” they had found it again, and everything was as it should be. I assume she did not know what really had happened, like the rest of the bus did. After having spent a bit of time in Pyongyang and the surroundings I feel that I’ve gotten a bit more insight in how North Korea works. From what I saw nothing the regime is willing to show outsiders is real. They even have a fake town.